I'm heading out again today ~ this time to North Carolina for business and a few days of exercise rest. Not sure how I am going to do it....I've been completely compulsive about my exercise lately ~ which I guess is not really a bad thing. I'd love to say that my compulsion applies to my running also, but no such luck. 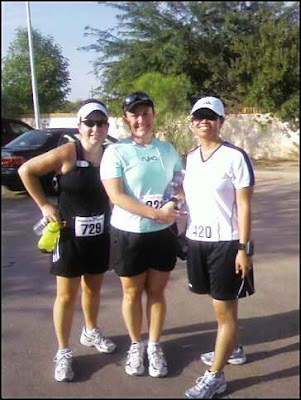 I did get a good run in on Saturday at the ARR Summer Series Race #4 ~ a hot, humid and sweaty 5K with Eileen and Lisa. I truly am starting to believe that there are Supreme Running Beings out there in the universe that get an immense out of pleasure it messing with me on a regular basis. It’s like every time I go out to run, one of the running gods (not sure exactly how many there might be) is rolling a dice, flipping a coin, or playing Rock/Paper/Scissors to predetermine the outcome before I even get started. My runs in CA during the month of June were FANTASTIC ~ my best ever. The couple shortish runs I’ve had since I’ve gotten back were MISERABLE ~ some of the worst. As I was plodding along last Saturday morning, swearing at the running gods for the torture, I remembered something I had said long ago: as runners, we are never defined by a single run. In other words, a good run does not a good runner make; nor a bad run does not a bad runner make. Pretty deep, huh???? 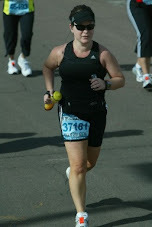 It is hard not to let a series of crappy running define me, but I’m not. I’ll just say that my running has sucked lately and leave it at that. I did manage to make some friends on my run last weekend. I even brought them home with me. I decided to name them GNAT. 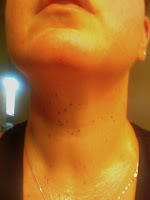 No, those are not moles or freckles ~ this is what happens when it’s monsoon season in good old Arizona and the humidity shoots up beyond anything that we are reasonably accustomed to. I had to block from my mind how many of these little critters I actually consumed or inhaled during this run ~ I chalk it up to helping me meet my protein target for the day. I’ve been holding steady with my workouts at the gym ~ trying for both a Body Pump and Body Attack class at least once a week. I’ve been good with my eating habits ~ even throughout a ton of traveling ~ but the scale still isn’t cooperating the way I wish that it would. But I feel good, and my clothes feel good….so I remain patient. I’m not patient by nature so I sure it wont last much longer. 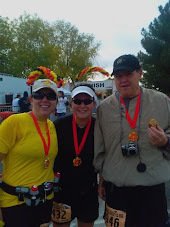 In other news, I’d like to announce the formal, official debut of team FOUR SCORE & SEVEN BLISTERS AGO, which will be competing in the American Odyssey Relay Run Adventure in April 2009. Our fun-loving, wacky team is made up of 12 runners; 10 of which are from various parts of the U.S. and 2 from Canada!!! Somehow this team of 12 is going to spend 36 hours together in van, run 200 miles of roads rich in American history from Gettysburg, PA to Washington, DC, have an AMAZING time doing it. Fellow bloggers Jeff, Rob, Katie, Nat, Cheryl, Ken and Micheline are part of my wonderful team, plus a few other non-bloggers (yet great runners!) who have yet to really determine how crazy the rest of us really are! I am both excited and a bit freaked out about this new undertaking ~ I’m sure it will be an amazing event. I’m sure I will ramble PLENTY about my team and this relay over the next 9 months. Truly. Why do I live here? I should have just stayed in San Diego. Travel some more (all for pleasure of course). Travel a wee bit more. Try to unbury self and retain sanity. So that's where I am right now. I am going to be out of commission for some more time ~ gotta get caught up at work just in time to travel again the week of the 21st (this time not for pleasure).